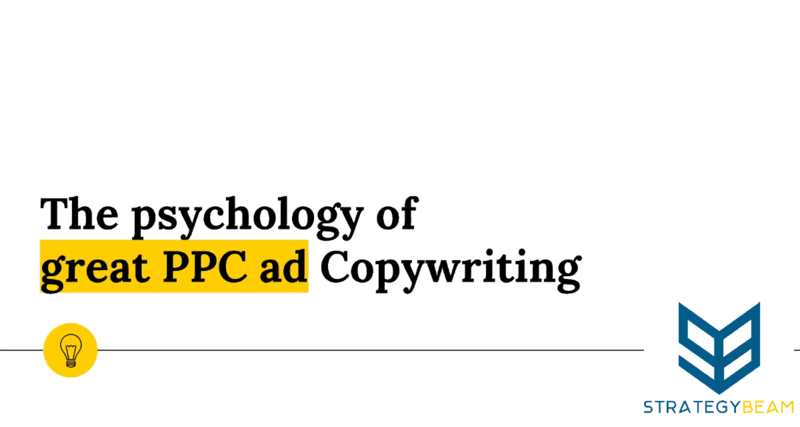 Hey everyone, today we’re going to take a look at the psychology of exceptional PPC ad copywriting. These tips will help you drive sales and meet your business goals with awesome PPC management strategies. This is very important whether you’re a small business or a large business because every time somebody goes and clicks on your ad you pay Google or you pay Bing. You also pay Facebook, but right now we’re going to be looking more at Adwords. This means that it’s imperative to understand the psychology of your user and how to write great PPC ads that drive qualified leads and get found online. This will make you more money so let’s go ahead and look at how to write great PPC ads. Is your ad is displayed? This occurs through keywords and the auction system. Does your ad gets clicked on, which is relevancy. Even if your ad shows up and nobody clicks on it, you’ll never have that chance to drive them to a qualified landing page. Does your landing page to convert. There are three parts whether you get found whether your ad gets clicked or engagement and then whether people buy from you. All of these components come down to the landing page so what goes into successful PPC. Let’s take a closer look at these three components and how to make them work for your company’s PPC strategy. Quality Score. This is an aggregate score that Google and Bing use to understand the quality and relevancy of your ad to the needs of an individual search query. Quality Score goes into the overall quality of your ad and how much you pay per click. The lower the Quality Score, the less likely the ad is going to show and the more money you’re going to spend Google. We always want to keep that Quality Score as high as possible because Google likes excellent content and wants to provide the most relevant answers to their customers. A high-Quality Score also helps your bank account because higher Quality Scores cost less per click. Ad group and relevancy of your ads are everything with PPC advertising. Keeping your ad campaigns structured tight and keeping content relevant is the best way for you to structure your ad group. A trick to boost relevant campaign structure is to structure your PPC campaign just like you would your website. Mirror your PPC campaigns and ad groups like your site is structured. If you’re just starting out with specific categories like shoes and then drop down into boots or summer shoes or you know different types of suede shoes. Mimicking how you have your website structured is an excellent place to start for your ad groups to keep your campaigns Quality Score and relevance high. The fourth factor to consider is keywords. This is the bread and butter of PPC advertising. Anytime somebody goes to Google; they ask a question with search terms. Within those search terms, there are keywords, and we always want to match those keywords with the products that we’re trying to drive. We’ll go into that more in just a little bit, but it’s also vital to use the keywords not only in the keyword structure of your campaign but also use those keywords throughout your ads. You also want to use your keywords on your landing page because again there are those three components that help your ads to get seen, help your ads to get engagement, and then also those ads lead to qualified traffic going to landing pages. Use keywords in your ads to get found. Use them in your ads to get clicks. Use them on your landing page. All of this will help you improve your Quality Score then again we’re looking at landing pages. We’re not going to go too much into landing page optimization today. I just wanted to dive in landing page overview because your landing page is what makes you money. The ads are what drive people to the landing page, but the job of your landing page is to make you money. Powerful PPC ad copy considers three parts, including the who, what, and why. What Is Your Ad For? Looking at the previous example, if you are a divorce attorney for men, then your audience is pretty specific. What’re their needs? Well, if you’re a divorce attorney for men their demands are not to get screwed through the divorce. You need to think about what your audience needs. In this case, they probably need to be comforted and also see that your value comes through saving time and saving money. If you’re a divorce attorney, you’re going to save them time, because they won’t have to deal with the crap throughout the divorce proceedings and you’re going to save them money because they’re not going to get taken for a ride. Then What Does Your Audience Want To Learn? Well, if your divorce attorney then your audience of males who are going through a divorce probably want to learn how you could save them time and how you could save them money. How you could comfort them again, that’s just one example, but you also want to look at why your audience cares. The reason why your customers should care about your products or services should be evident in your ad copy and landing pages. What action should they take based on your ads? Well, they should call you so that they can end this terrible time in their life. The desired effect depends on where they’re at in their buyer journey. They could save money or time with your business products or services. You solve problems for your customers, so make sure that you show that in the ads. This is why people click on your ads as they use specific terms. Information that your audience would like to know should help them understand that you know what you’re talking about and you’re the right choice for them. Instead of just talking about an engine you could say V6, 600 horsepower or whatever. Obviously, I’m not a car guy, but maybe you are and you use PPC to sell automotive services. Think about your audience and use terms that they will be looking for to make yourself look more credible. If you’re a hotel, then your objective is to offer the best rates and maybe free breakfast or something similar. People searching for your product want a beautiful place to stay, and they don’t want you to rip out their bank account. If that’s what they’re going for ads in campaigns, think about your PPC ad keywords. Make sure that you optimize the entire campaign based on who your audience is, what they’re looking for, and what their objectives. This is kind of a pro tip that I’ve left out of out of the slides. One thing that I’ve noticed, especially with Google, is that you want to fill out everything in your PPC ad. Be sure to not use the same keywords or the same formats in all of those and specifically with paths. For example, if we’re a divorce attorney I always would like to add my geolocation like Orlando in Path 1 and then the specific industry in Path 2. This approach helps Google understand what you do and where you are. That’s a pro tip that you could play around with for your company PPC advertising. You never want to double up with the same content for different ad groups, because each ad group is kind of like how your website is structured. You would never put the same content in one category on your website as you would another, so don’t want to get lazy in your PPC ads since you pay Google for each click and you want the highest Quality Score possible. We want to make sure that we’re creating unique content because every ad group should be tailored to a specific needs of your audience. Everything about your PPC strategy comes down to the fact that you want to sell something. Since you’re paying Google for every click, you want to make sure that every click will lead to a purchase. You could use emotional triggers to help drive engagement, so how do you do this? Well, identify your customer. Again, you need to have a good understanding of who your customer is, what they want, what they’re looking for, and then use emotional triggers. This breakdown might sound sleazy, but remember that you are not trying to trick people. If you’re a divorce attorney for men, then their worst enemy is probably their wife or soon to be ex-wife. What do they hate? In our example, the person searching for a divorce attorney probably doesn’t like that person too much. Who’s their best friend? You could be that friend. What do they love? In our example, our audience probably loves not having to worry about this crap in their life. So, once you identify the emotional triggers, you can optimize your PPC ads to boost engagement and drive qualified leads to your site. This will help you close more sales and meet your business goals. If you can solve the problems of your customers, then you will make a lot of money. Start with their why. Understand why they’re looking for your products and services. This conceptual thinking kind of goes beyond what the problems are because there are other solutions out there, so really think about what differentiates you and your competitors. Use those differences in your ads and intertwine relevant keywords. Then use urgency, because again you’re paying Google each time somebody clicks on your ad. You don’t want them to be willy-nilly about purchasing once they click on your ad because you already paid Google $5 or $10 a click going you’re going to your website. Paying Google for this opportunity and having a customer not convert on your landing page can hurt your bottom line. Your customer’s whole journey needs to have urgency, so people take action and give you their money. We already talked about this, so integrate keywords into the Headlines, the Paths, and the Description. Make sure that you intertwine those keywords throughout all touch points because that’s going to improve your Quality Score. Also, consider those emotional needs and expectations of your audience. You want to build that relationship so that by the time somebody clicks on your ad they already trust you enough to buy from you. That comes in a lot to the landing pages which we’ll talk about later, but for right now we just want to look at the PPC ads. How do you alleviate risks and fears? Well, you always want to make your customers feel safe. Use social proof. You could do this on your landing pages to help your customers feel better about things such as testimonials. Use specific messaging in your ads and landing pages. Phrases like “Special Offers,” “As Seen On,” “Money-Back Guarantee,” and “Quick and Easy.” You can also use that kind of terms in your PPC ads so that it drives engagement. Build that relationship and trust with your audience at each stage of your interaction with customers. Use Psychology To Craft A Profitable PPC Strategy! So just remember guys that as you go and build out your PPC campaigns, it’s more than just the ads. You have to look at the keywords at all levels of your PPC campaigns to drive qualified traffic. Always think about that three-pillar approach between getting found, getting engagement, and then making sales. The landing page is where you make the sales. How you get found is with your Quality Score. Thanks a lot for your time today. If you have any questions, go ahead and email me at [email protected]. Go ahead and leave a like comment and subscribe below if you enjoyed this video you can leave a dislike if you did not like it that’s fine too. Also, go ahead and leave a bunch of links down below that you can continue your research here but again guys until next time we look forward to seeing you thanks a lot.